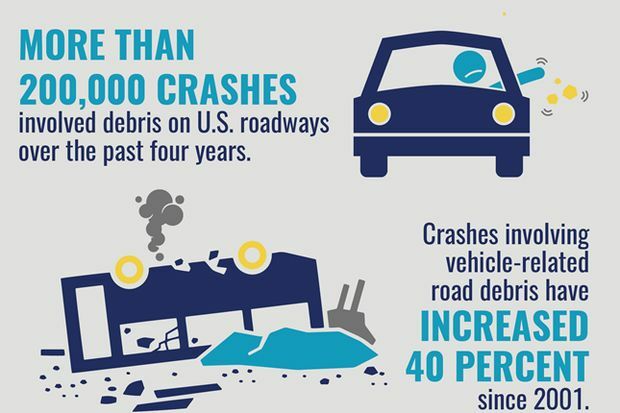 More than 200,000 crashes involved debris on U.S. roadways during the past four years, according to a new study released by the AAA Foundation for Traffic Safety. Road debris has resulted in approximately 39,000 injuries and more than 500 deaths between 2011 and 2014. AAA is calling for drivers to properly secure their loads to prevent dangerous debris. Crashes involving vehicle related-debris increased 40 percent since 2001, when the Foundation first studied the issue. • Nearly 37 percent of all deaths in road debris crashes resulted from the driver swerving to avoid hitting an object. Overcorrecting at the last minute to avoid debris can increase a driver’s risk of losing control of their vehicle and make a bad situation worse. • More than one in three crashes involving debris occur between 10 a.m. and 3:59 p.m., a time when many people are on the road hauling or moving heavy items like furniture or construction equipment. • Debris-related crashes are much more likely to occur on interstate highways. Driving at high speeds increases the risk for vehicle parts to become detached or cargo to fall onto the roadway. The AAA Foundation study determined that in California between 2011 and 2014, there were a total of about 45 fatal crashes resulting in 47 deaths that involved road debris between 2011 and 2014. The end of the month when individuals are moving from residence to residence tends to be a prime time for littering freeways with furniture that have fallen off trucks. And Caltrans statewide spent more than $76 million last year on litter removal, collecting enough trash and debris from freeways to fill more than 9,500 garbage trucks. • Maintaining Vehicles - Drivers should have their vehicles checked regularly by trained mechanics. Badly worn or underinflated tires often suffer blowouts that can leave pieces of tire on the roadway. Exhaust systems and the hardware that attaches to the vehicle can also rust and corrode, causing mufflers and other parts to drag and eventually break loose. Potential tire and exhaust system problems can easily be spotted by trained mechanics as part of the routine maintenance performed during every oil change. Currently, every state has laws that make it illegal for items to fall from a vehicle while on the road. Most states’ penalties result in fines ranging from $10-$5,000, with at least 16 states listing jail as a possible punishment for offenders. AAA encourages drivers to educate themselves about specific road debris laws in their state. Drivers should also practice defensive driving techniques while on the road to prevent debris-related crashes from occurring.